Working on repairs, restorations and lighting creations, it is important to use products designed to fit the right application. A socket is not just a socket. It could be an E39 Keyless Porcelain Socket. And a bulb is not just a bulb. For the E39 socket you would need the right bulb to fit. Fortunately, there are standards in the lighting industry where parts are built to spec. Pieces of an older lamp that fail can be replaced with an almost exact replacement part. Worn out sockets and switches can be replaced. Bulbs are manufactured to meet these same standards to fit the socket. 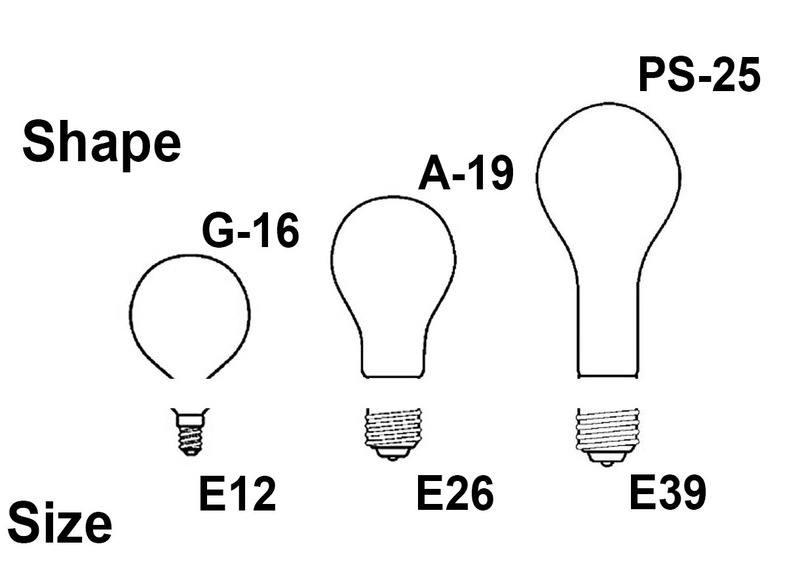 Bulb shapes are difficult to explain. The standards for bulb shape relate to the width, height, and curvature. 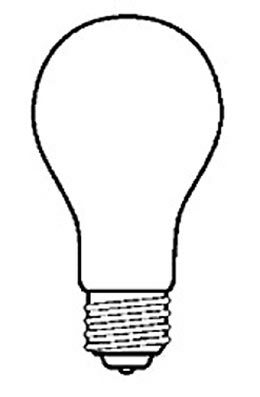 For an A-19 bulb the A parts describes the shape and the 19 is the size of the bulb. For the A series bulbs, the width is measured in 1/8 inch and an A19 is 2 3/8 inch wide ( 19 times 1/8 inch). 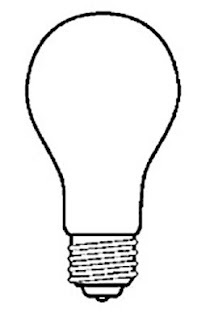 Other bulb shapes like the G, PS, CT, or T all describe the shape and the corresponding number is the size. These standards are part of the ANSI C79.1-2002 Nomenclature For Glass Bulbs Intended For Use With Electric Lamps. If you want to learn more, good luck with that journey. Socket sizes follow a simpler rule of Type-Size. E type sockets are the most common. The E stands for Edison and designates a screw type socket. The size is a simple measurement of width in millimeters. 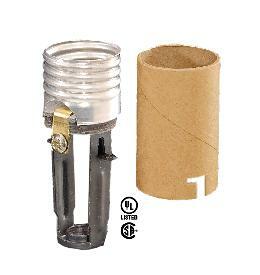 An E26 socket (most common type) has an Edison thread interior and is 26 millimeters wide. This socket is also referred to as a Medium socket. The 3 most common sockets in the USA are the E12 (candelabra), E26 (medium) and the E39 (mogul). As this table shows, there are some sockets in between these sizes. For traditional lighting, those three are the most commonly used. 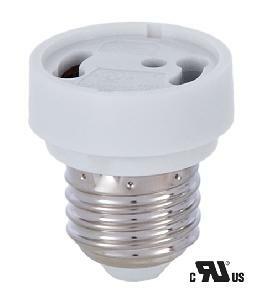 California requires remodels and new construction use a GU24 (bi-pin) socket. These types of sockets require matching bulbs and maybe limited to CFL or LED bulbs. Traditional sockets can be adapted to GU24 sockets with a simple adapter. As always, there are some exceptions to the rule. One exception might be a failed swivel on an old lamp. No matter how hard you try, the replacement piece does not exist. This is true, but swivels, arms, bodies, and bases are decorative features and not electrical parts. The standards for these parts are part of the thread sizes. A different topic. Another complaint might be related to a European fixture. Maybe it has bayonet sockets or a strange size thread socket. Standards are still in play but are subject to regional preferences. Some older European fixtures have E17 Intermediate sockets. If you are in the process of a repair for a US market, convert the sockets to E12 Candelabra since these bulbs are easier to find. This article only scratches the surface of bulb and socket standards. We didn't touch Wattage, the measurement of energy consumption for bulbs. We also didn't cover specialty antique style or decorative bulbs shapes and styles. What you can do with this new found knowledge? We suggest using it for light conversation at your next dinner party.